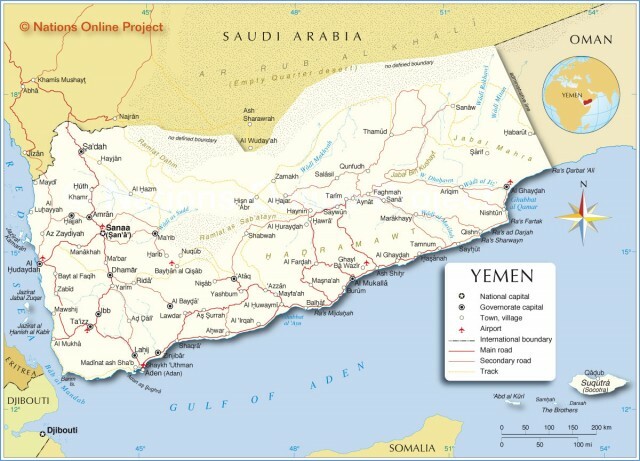 YEMEN, NO MATTER how it is defined or what its current political structure, has always controlled the southwestern tip of the Arabian Peninsula—the BAB EL MANDEB choke point to and from the RED SEA. Yemen’s neighbors are SAUDI ARABIA and OMAN and the country is about twice the size of WYOMING. It is the closest point to sub-Saharan Africa (especially DJIBOUTI and ETHIOPIA—with which it has had a long historic association. It also has been a major caravan route for land trade from the INDIAN OCEAN to the Arabian Peninsula and on to the MEDITERRANEAN SEA. The recent discovery of the ancient trading city of Ubar was accomplished using remote sensing and satellite images. In biblical times, Yemen was the home of the queen of Sheba (related to the Sabaean Empire). In Roman and medieval times, it was the center for the lucrative spice trade, especially frankincense and myrrh. Today, the Yemen desert country has few natural resources of interest to global powers. Its primary asset is geopolitical control of the all-important choke point (Bal el Mandeb) for the Red Sea and Suez Canal (and ultimately the Mediterranean). In modern times, following North Yemen’s independence from the OTTOMAN EMPIRE in 1918, the British took control of the area, especially of the key port of Aden. This was essential for British Empire trade to and from INDIA and the Far East. British control ended in 1967, and three years later, the southern government adopted a Marxist orientation. The massive exodus of hundreds of thousands of Yemenis from the south to the north contributed to two decades of hostility between the states. The two countries were formally unified as the Republic of Yemen in 1990. A southern secessionist movement in 1994 was quickly subdued.